The U.S Department of Energyâ€™s Home Energy Score Program is geared toward motivating consumers to undertake energy and cost saving improvements in their homes. Through the use of the Home Energy Scoring Tool, qualified assessors can provide consumers with credible and useful information about their homes at a relatively affordable cost. The tool generates a score, a label, and customized recommendations. 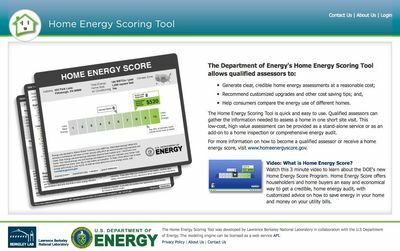 Although many home energy software tools provide useful information to homeowners, the Home Energy Score can only be generated using the Home Energy Scoring Tool. The tool applies a standardized set of questions, calculation methods, and assumptions. This ensures that consumers, such as home buyers considering multiple homes, can compare the Home Energy Scores of different homes and be confident that the comparisons are valid. If a qualified assessor prefers to use other software to generate additional information for the homeowner, the software developer can use APIs to link their software tool to the Home Energy Scoring Tool and thereby avoid double entry of data. With funding from the Department of Energy, Lawrence Berkeley National Laboratory developed the Home Energy Scoring Tool, based on the Home Energy Saver methodology. Complete technical documentation is available here. For more information on the Home Energy Score, visit www.homeenergyscore.gov.